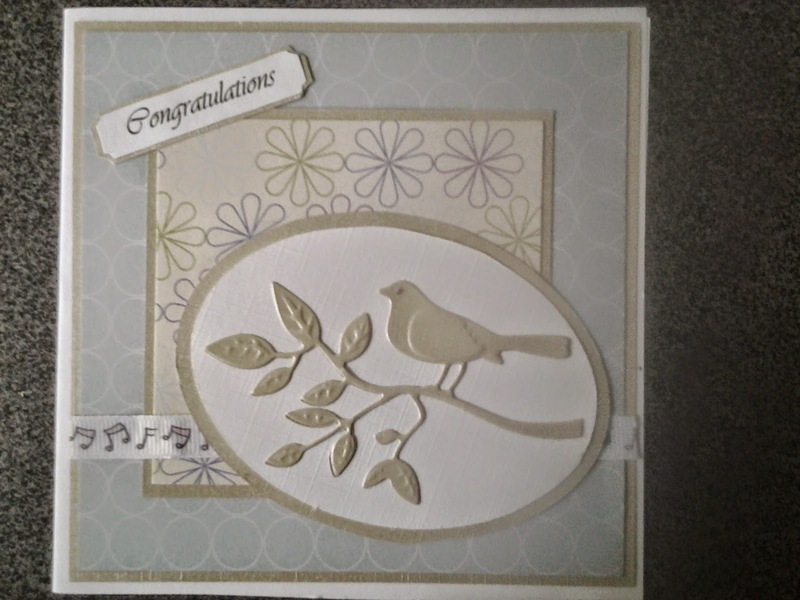 Today I thought I'd show you some of the cards I've made with the bird die by Marianne Creatables LR0138, Bird on a big branch. Here I'm really trying to showcase both the die and the beautiful gold linen paper I got at the Action. I love this paper. I love this simple sketch design. I stuck with soft colours for my design paper and I used some Forever Friends ribbon with notes on it to finish it off. All in all, I was pretty happy with this card. This time I used design paper to cut out the die with and placed it in a plain pastel pink circle. 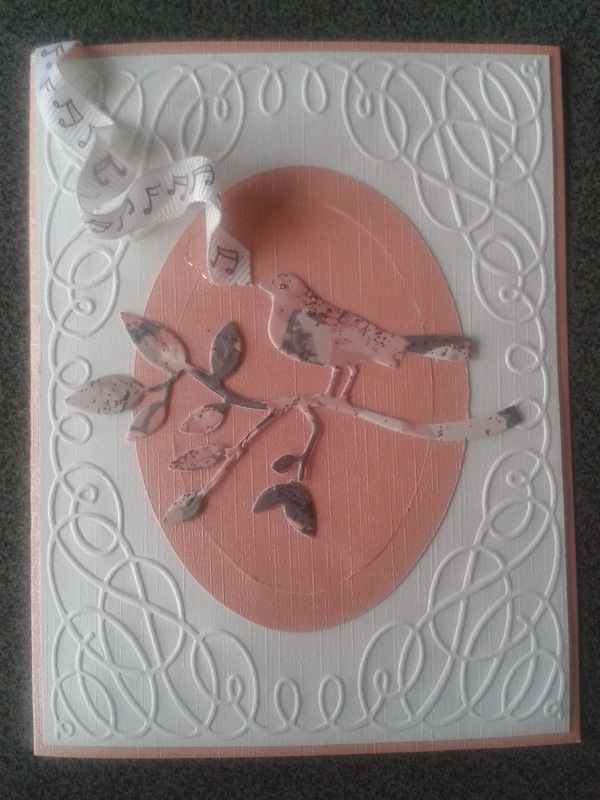 I also used the scrollwork embossing folder by Cuttlebug - which I love the look of but it's actually too big for my liking, considering we use cm here and not inches, it never fits onto my simple A5 folded in half cards, so I have to remember to get the card base colour I want to use in A4. Ah well, such is life I suppose. Back to the card above, I also used some forever friends ribbon with lovely pink music notes on it, and made it look like the bird was whistling, which I thought was a cute touch, but I could be wrong of course ;). Unfortunately I will never give this card to anyone as you can see that there's a major flaw, namely the circle is cut out twice. At first I wanted this to be a frame under the bird but found it looked silly. Then I wanted to cut a new pink oval in the right size but I had already used up all of that pink linen paper. When I went to buy more, they no longer had it >:( Again, such is life. Hope you enjoyed these cards and can find inspiration from them and...check ya later!